My best friend, Carlock, had a big birthday a few weeks ago. I thought it was the perfect time to try a new flavor. What’s that? No, that’s not her real name. I’ve changed it to protect the innocent. Okay, that’s not true. It’s just what we call her… we had too many Meagan/Meghan/Megan/Meaghan’s in our high school class. Nicknames had to be created. Plus, it’s catchy, don’t you think? Anyway, these were a HIT. 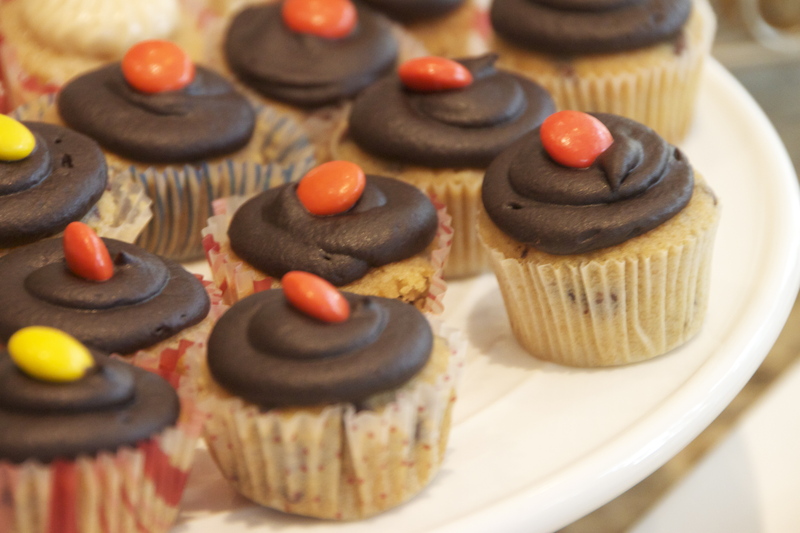 Hello, peanut butter cake, spiked with mini chocolate chips, covered in dark chocolate buttercream. Then, just in case you didn’t have enough, topped with a single Reese’s piece. Certainly a keeper. Oh! And Carlock loved them! I can vividly remember the moment I fell in love with coconut cake. I was 9 or 10 years old. Granddad and I were visiting my grandparents best friends, my Aunt Rosie and Uncle Ed, at their beach house. As soon as we walked in the door, my Aunt Rosie, as she usually did, asked us if we wanted something to eat. I don’t think we even got a chance to respond. Before I knew it, Aunt Rosie pulled out a Sara Lee Coconut Cake from the freezer and it was set. We were eating coconut cake. I’m not even sure if I had really had coconut anything before that afternoon. But I was going to try. It would have been rude not to at least try. Well, that first bite was glorious and I was sold. Keep in mind, a frozen Sara Lee cake sold me on coconut cake. That’s right. Frozen. Sara Lee. Turns out, this was just my introduction to coconut cake. My true love (and, perhaps, obsession) began when I met the coconut cake from Jimmy’s Grill in Bridgeville, Delaware. Words can honestly not describe the incredibleness. Moist layers of cake. 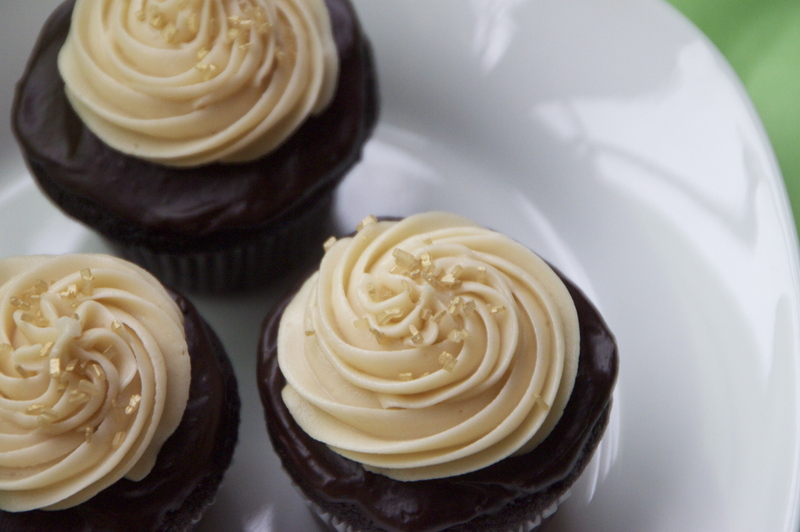 A sweet, delicate buttercream. Outer layer of sweetened, grated coconut. Heaven on a plate. In fact, if you put this cake in the kitchen with my family, it will be gone – gone – within 1 1/2 days. Trust me. It’s been tested. And plates are optional. 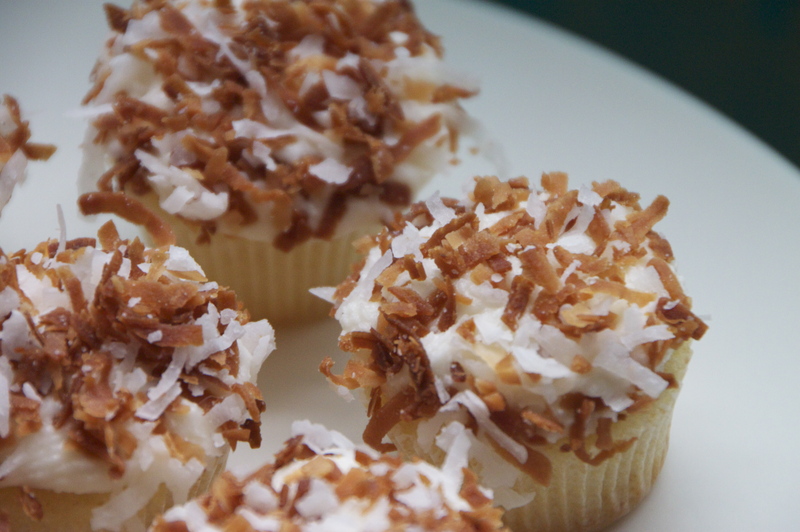 Obviously, when I started Kristina’s Confections, a coconut cupcake was a no brainer. After a bit of testing, I settled on Triple Coconut. 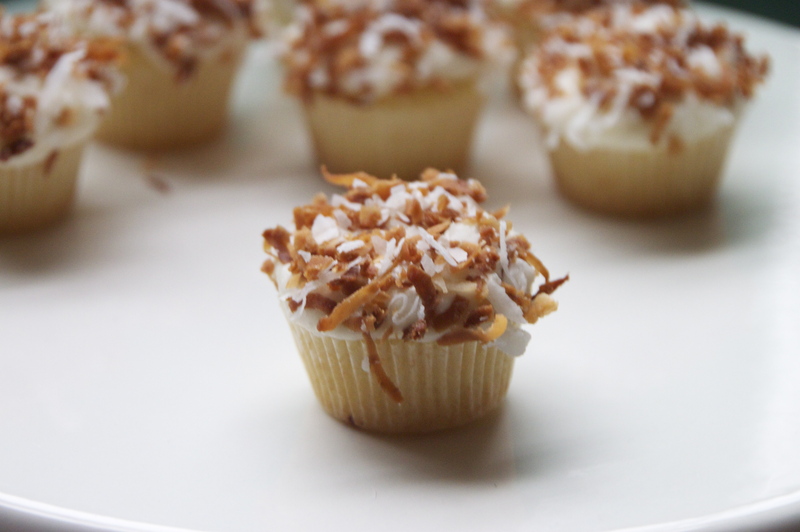 Coconut in the cake, in the buttercream and covered with fresh and toasted coconut flakes on top. Is it Jimmy’s? It has a different texture because of the extra coconut I add. But my customer’s love it. So do I.
It’s March. Finally, glorious March! So what, you say? What’s so great about March? Irish cupcakes in honor of the one, the only, St. Patrick’s Day. These are mimicked after the famous (or, more accurately, infamous) Irish Car Bomb drink. 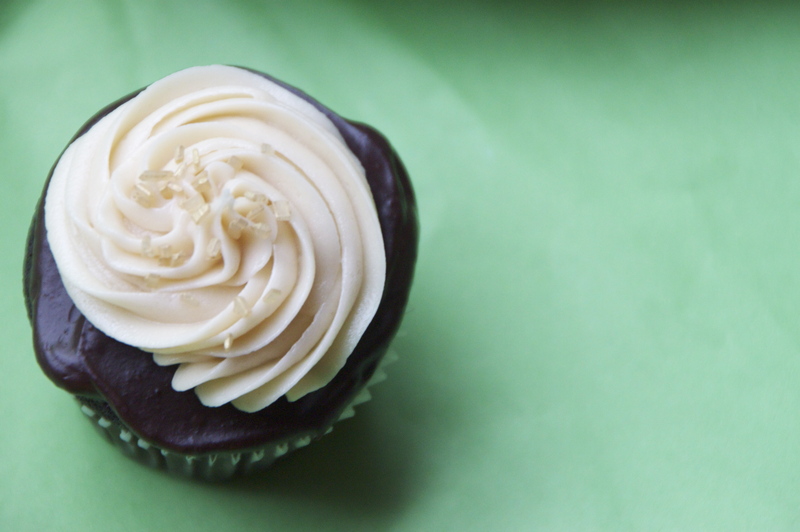 The base is a Guinness chocolate cupcake, topped with a layer of ganache and finished with a swirl of Bailey’s buttercream. Adult’s only here folks. Trust me, we adults have the luck o’ the Irish with us on this one! I love chocolate and mint together. Again, my crazy mother hates this combination (I know, weird). In the Kristina’s Confections kitchen, however, my taste buds get more votes. Lucky. For. You. 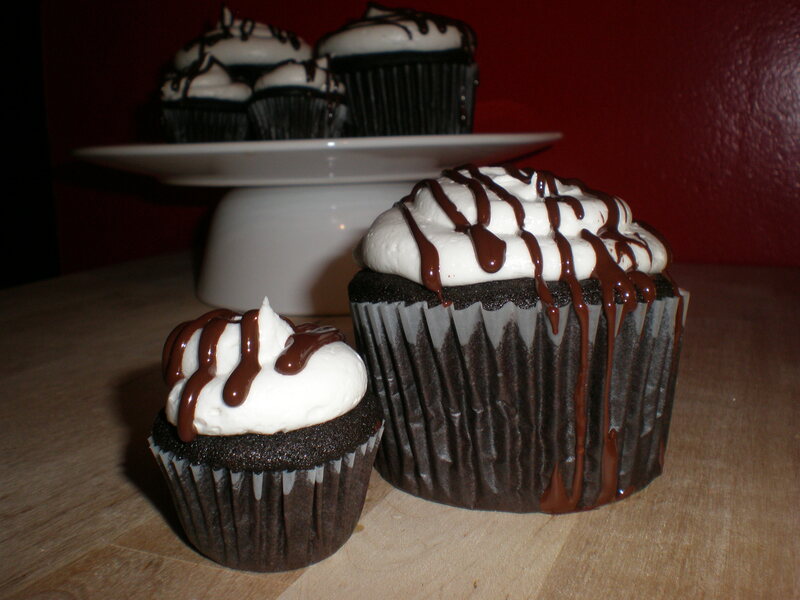 Dark chocolate cupcake mixed with dark chocolate chunks and a touch of mint. Topped with a luxurious mint buttercream. Finished with a dark chocolate mint drizzle. Refreshing and seriously delicious. The new after dinner treat!!! I’ll be honest, I’m not a huge ginger person. I pass on the pickled ginger when I eat sushi. I don’t think crystallized ginger is a candy substitute. And I’ll take pumpkin bread over gingerbread any day of the week. But I know I am not America and people love gingerbread (and all things ginger related). My grandfather loves gingerbread, a fact I only recently learned. I have a friend who waits all year long for gingerbread latte season. And I know there are a lot more folks like them out there. I thought it fitting that I work on something for the ginger lovers out there. And I’m excited to introduce… gingerbread latte. A ginger spice cupcake topped with a vanilla cream cheese latte frosting. The result is a perfectly warm winter treat. Just in time for this cold weather. Just in time for the holiday season. This just might change my opinion on ginger. 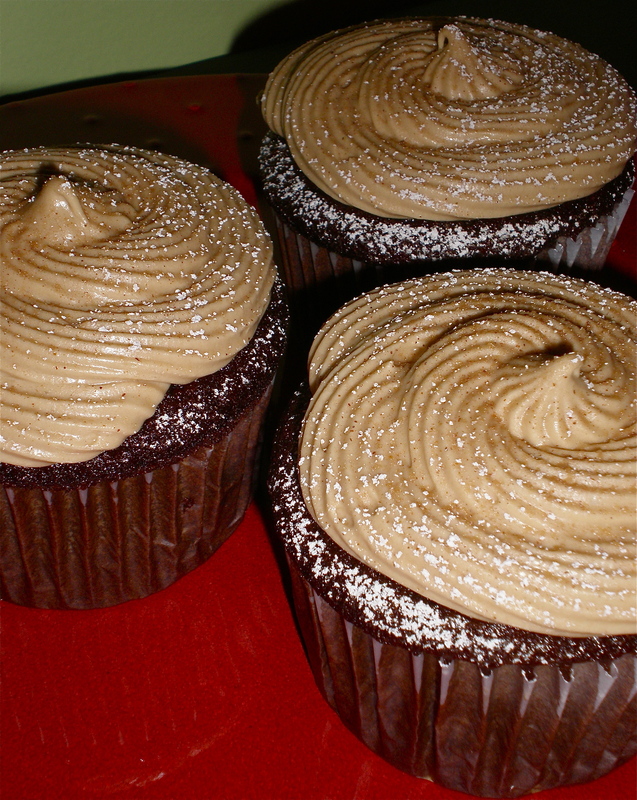 Betcha didn’t know today is National Chocolate Cupcake Day! Please don’t get this confused with National Vanilla Cupcake Day (November 10) or National Cupcake Day (December 15 – although, there appears to be some debate about this one). 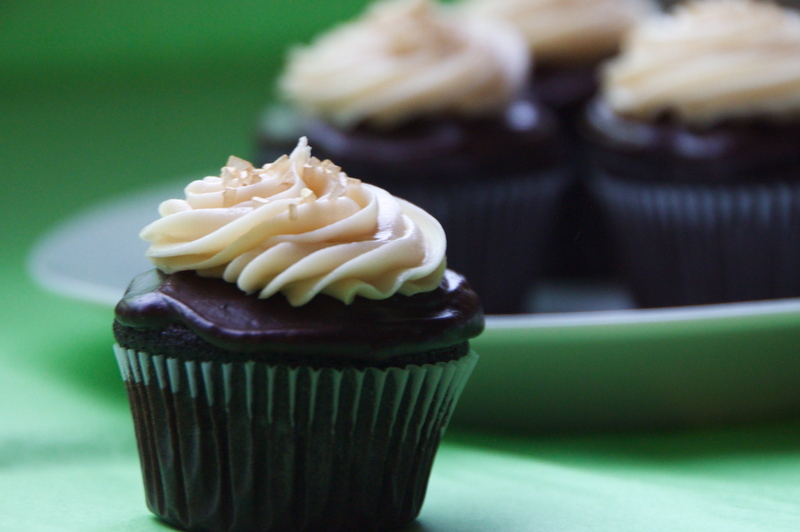 Nope, today is dedicated to the chocolate cupcake only. In honor of this monumental day, I am debuting a new cupcake flavor. Are you ready for this? 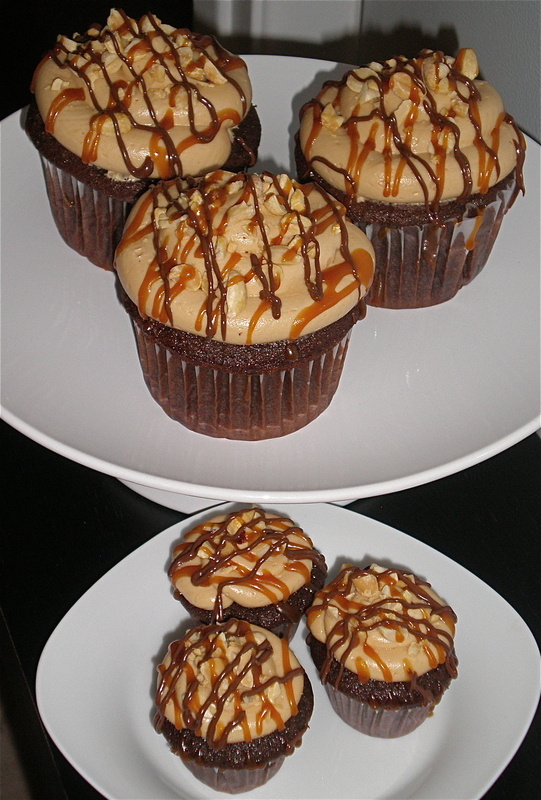 Please welcome the Snickers cupcake to Kristina’s Confections! A chocolate base with bits of real Snickers, topped with a caramel buttercream and finished off with roasted peanuts, a caramel drizzle AND a milk chocolate drizzle. Ladies and gentlemen, this is a serious cupcake (okay, as serious as cupcakes can get). Rich, decadent and oh, so delicious! My Mom’s absolute favorite cake is carrot cake. My Aunt Dot used to make her one every year for her birthday. Aunt Dot actually hated doing it – grating the carrots really got to her – but Mom’s a December baby. You know how that goes. She had to get something special to outweigh all the negatives of being born a mere twelve days before Jesus. Carrot cake it was. When I started Kristina’s Confections I knew I needed a really great carrot cake – not only to appease Mom, but also for all the other carrot cake lovers – and there are plenty out there! Carrot cake is a funny thing though. There are a million versions, with all sorts of additions – pineapple, coconut, walnuts, raisins. 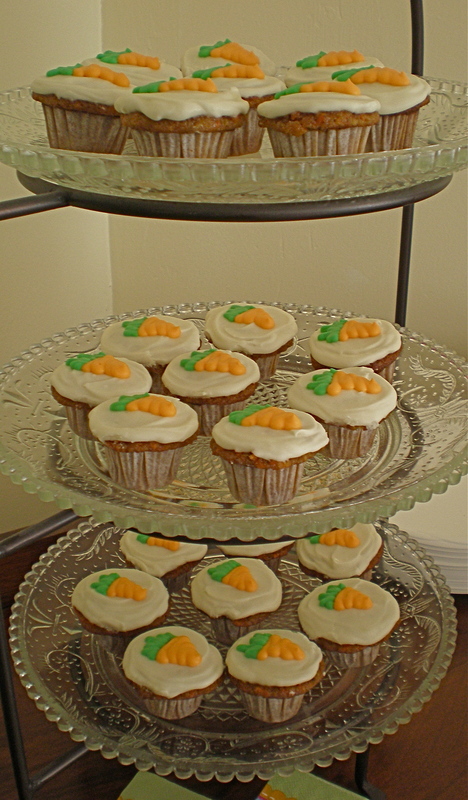 For me, I wanted to get back to the classic carrot cake – where the spices and the carrots shine. So that’s what I did. This is a back to the basic carrot cake, filled with grated carrots, tons of cinnamon, a dash of nutmeg and a touch of vanilla. And, of course, the classic cream cheese frosting tops it all off. Aunt Dot is now watching this crazy life from a better view, but I think she’d be pretty impressed with my version of carrot cake. She would claim hers had an edge, but that’s just family talk. Mom doesn’t seem to have any complaints. Perfect pairing: pretty much anytime, with anything!